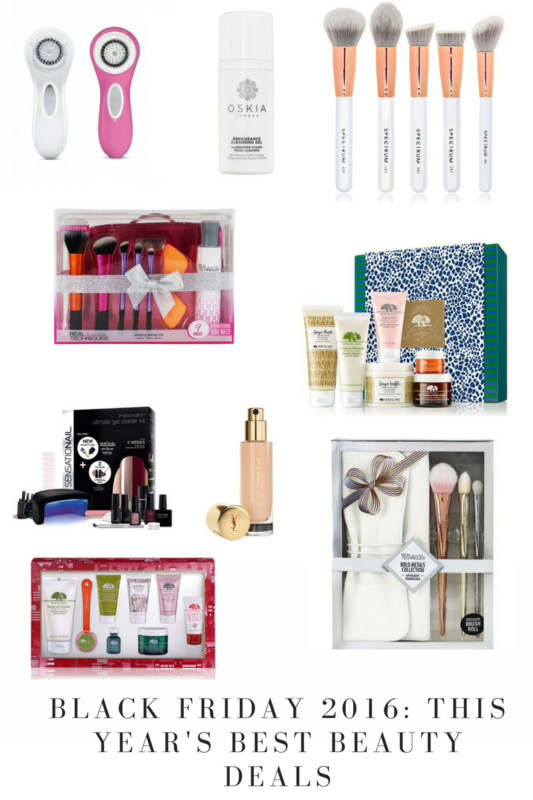 Here’s my guide to this year’s very best beauty bargains and where you should be clicking on Friday to snap them up! Asos are offering 20% discount on everything until Tuesday! To get this amazing deal use code GOGOGO at checkout. Elf are offering 50% off site wide using code BLACKFRIDAY at checkout. Urban Decay’s Perversion Mascara will have 20% off for the whole of the cyber weekend. Superdrug Black Friday Deals top picks include the Real Techniques Artistry Makeup Brush Gift Set, reduced from £79.99 to £34.99 and the Elizabeth Arden 8 Hour Set reduced from £60 to £20. There is also the B Complete makeup brush set online only deal reduced from £70 to £35 here. Stock up at Cult Beauty and get £5 off with a £50 spend (code BLACK5), £15 off with a £100 spend (code BLACK15) and £30 off with a £150 spend (code BLACK30). Boots Black Friday Deals top picks include SensatioNail – Limited Edition Ultimate Gel Starter Kit reduced from £80 to £45 and the massive Real Techniques Mega Set reduced from £100 to £40. My favourite of all though is the Real Techniques Bold Metals gift set for £20 which is half price! Link here. Oskia will be offering a 20% discount on all full-sized items. The sale will start at 6pm on Thursday 24th November and last till 11:59pm on Friday 25th November. YSL are offering customers 15% off foundations, mascara and skincare at YSL Beauty from Friday 25th till Monday 28th November. The beaut brushes from Spectrum are going to be available with a whopping 30% off…woo! 10% off beauty and fragrance. Code is SELFCCE. Instore and online. The brand are offering 15% off from 25th – 27th November if you use code FRIDAY15 link here. Sanctuary Spa’s Make A Wish Gift Set (RRP £45) Christmas gift will be just £23 at Boots. Kiehls have 20% off everything at Kiehl’s UK with the purchase of 2 or more products! This offer will be available on 25th and 26th November. Boots have an online only deal for the Remington Shine Therapy Hair Straightener S8500 with Moroccan Argan Oil which is reduced to £36.00 and was £79.99. The classic GHD IV Styler is reduced to just £79 on lookfantastic and you can use code RUSH to get 18% off on top of that. The Clarisonic Aria is reduced from £155 to £93 at Current Body website. Save up to 25% off online when you spend £60 or more and use code BLACKFRIDAY to save £15. With a saving of almost £50 on T3 Haircare’s hero product the Whirl Trio, the Black Friday weekend sale on T3 Haircare t3haircare.co.uk is a must see for those wanting to buy the best hair styling tools. I have never used a better hair dryer than my T3 travel dryer so grab yourself a bargain. T3 will be offering 25% off across the whole website from Friday to Monday! Pai are offering 25% off site-wide at paiskincare.com which begins at officially 7pm GMT today (Thursday 24th through to Monday 28th November). The code is BLACKPAIDAY. Omorovicza are offering 30% off of everything at checkout right now! If you have any other tips and hints please do leave them below for everyone to share!